A few months ago, Judy from Stitchalongwithme and I decided to do a heart exchange. We would each piece a heart, embellish half of it, and then exchange it for the other person to finish. 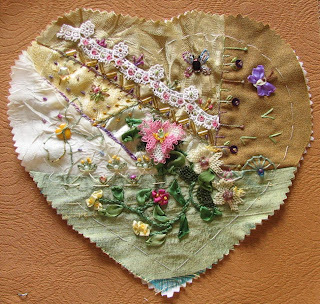 I received Judy's heart along with my finished heart and a goodie bag which included an embroidered heart, buttons and lace. Thank you Judy. This is my heart as I sent it to Judy. I finally got to use some of the oyas from my dear friend Rengin. 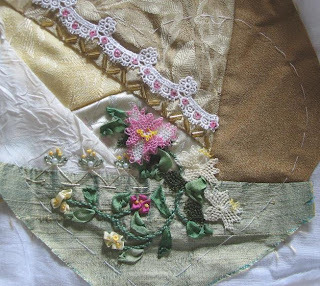 Here is the beautiful completed work done by Judy. Thank you so much! I hope you will be as happy with yours. This is Judy's heart she sent to me. After a busy weekend and still busy week I did manage to do some stitching. I can't post it until she gets her heart back. Sorry Judy you will need to wait. 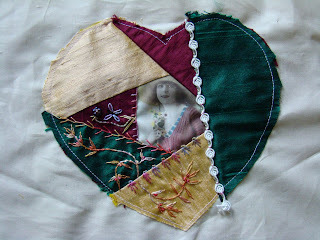 I love the variegated thread she used on her heart and mine. That is one thing I lack, variegated floss. I have one skein of purple. I guess I really need to consider an online shopping trip for some variegated floss. Now I can't wait for the mail! It was fun to work on your heart, and I'm so glad you liked it. Lots of folks commented on the pretty SRE that you did! I've gotten lots of my varigated thread from Susan http://cq4fun.livejournal.com/; she's now selling her own brand on her etsy. I'm going to have to get some of that Oya; it's cool. 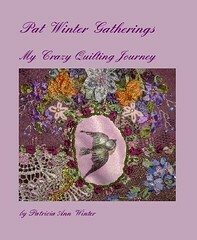 Kathy: Justed wanted to say thanks for stopping by my blog and that I enjoy visiting yours. Aren't those oyas just wonderful? Your hearts are divine :-) I am also soooo impressed with your tatting - I tried, but to no avail, my fingers just won't listen to me! Thanks again for your visits and the encouraging comments you leave. Hope you are having a blessed day! Those are all so beautiful! How special and fun to be a part of something like that. Judy, as you know yours is on it's way. Jules, Thanks for stopping by. Tattingchic, Thank you and yes it was fun. I just hope she is pleased with hers.